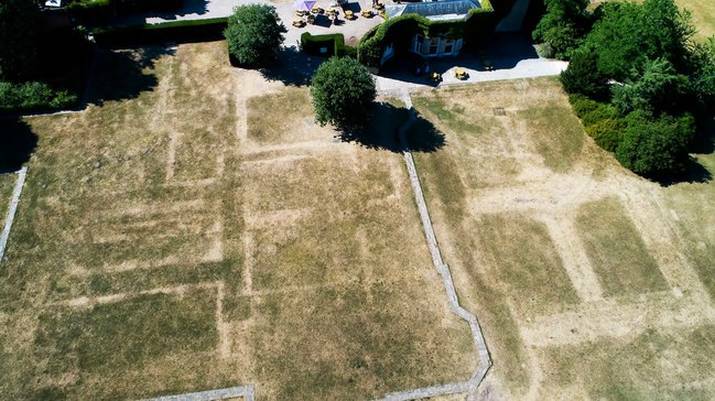 The scorching summer of 2018 was a great gift for archaeologists. For the first time in almost two decades an unbroken dry spell brought features below the surface of the landscape clearly into view. These ‘parch marks’, visible only for as long as the weather holds, provide the very fullest evidence of the foundations of earthworks, buildings, roadways not only of a medieval date but reaching back across the whole timespan from the Industrial Revolution into pre-history. 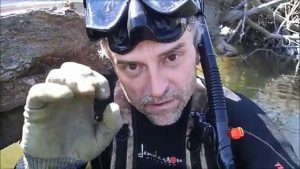 It seemed counter-intuitive then to take a call from a TV researcher developing a new series devoted to underwater archaeology. In fact, there was good reason why The History Channel had chosen this moment to schedule the filming of their new series aiming to show that a stretch of inland waterway is as rich in hidden archaeology and history as any expanse of ocean. If not carrying quite the same decompression risk of diving the naval wrecks off the coastlines of Africa or Australia, you’d be best advised not to wade very far into the Avon, Severn or Ouse except when the rainwater table was at an all-time low. 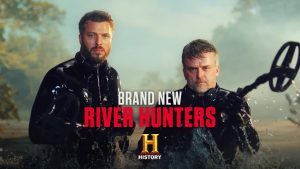 The series, River Hunters, takes its inspiration from the USA where searches of the waterways close to Civil War battlefields have uncovered some remarkable artefacts. Arguably the trend-setter is Beau Ouimette, whose self-produced shows on You Tube are on the brink of becoming a global phenomenon. Producers persuaded Beau to bring his unique brand of wading to Britain, to sift the course of some of our most historical significant watercourses. 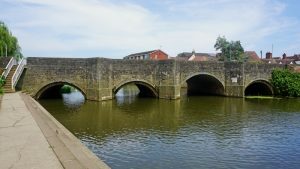 Beau’s passion is battlefield history and it was hardly surprising that his schedule should take in Tewkesbury, where tributaries of the Avon and the Severn frame the site of the Wars of the Roses battle where the Lancastrian cause was decisively defeated in 1471. 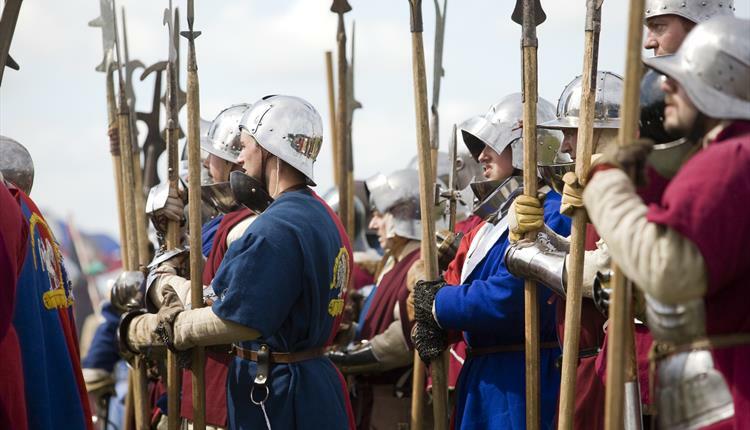 Tewkesbury was not as large a battle as Towton (1461), seeing combined forces of no more than 10,000; nor did it bring a virtual blitzkrieg to the town as occurred at both the first (1455) and second (1461) battles of St Albans. But it did represent no lesser watershed moment: the Lancastrian interest was all but destroyed. Leading Lancastrian nobility lay dead, among them, John Courtenay, earl of Devon, who had only just returned to the royalist fold. Henry VI was captured and then killed; his son and heir, Edward of Westminster, died in the melée; Henry’s queen, Margaret of Anjou, who had led his the cause for the best part of twenty years, was forced to return to France. The river tributaries played a central and decisive role in the battle. They were the reason that battle was drawn at Tewkesbury: the Lancastrian army had hoped to cross the Severn at Gloucester but the Yorkist force stood in their way, so they had tried to pass ahead of them by pressing further north. When the Lancastrian battle-formation was broken and the Yorkists set about a rout, the remnant of King Henry’s force fled for the Severn bank knowing that if they crossed it they might fight another day. Most were cut down by the waterside, or were drowned. 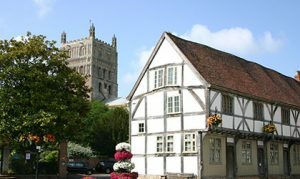 The battlefield also lay in the shadow of the Benedictine abbey of Tewkesbury its own precincts bordered by the same river tributaries. In the rout some struck out for the abbey, although for the Lancastrians the only sanctuary they found was a burial place on sacred ground. So Beau and team came in search of both the Wars of the Roses and the monastic tradition. It was the last truly hot weekend of the summer and they waded into the Swilgate south of the abbey grounds with the excitement of a day at the seaside. Perhaps those Civil War sites are very willing with their secrets but here it was slow going. By the half-day mark, the low-lying murky water had offered up only some very eclectic signs of 20th-century life: a roadworker’s lantern and a cache of printers’ letterpress type. 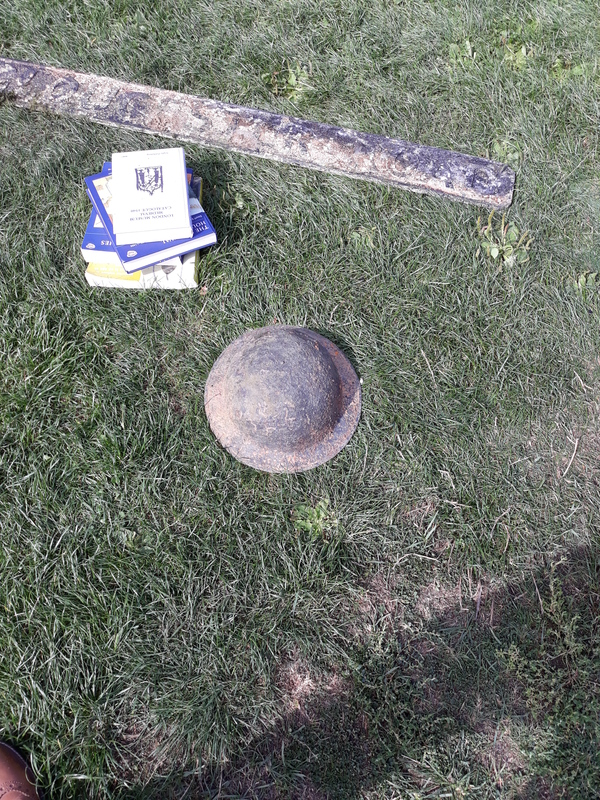 Early afternoon took us no further back in time but gave us the basis for a narrative: a World War 2 era firewarden’s tin helmet, a testament to the six-year vigil that watched over the abbey tower. Predictably perhaps, it was only as the light finally began to fade, and even the ebullient Beau looked less than comfortable seven hours into his wet-suit, that the river offered a tantalising hint of medieval Tewkesbury. Pressed deep into a wedge of silt, the detector led to hand-worked pins and studs surrounding the remains of leather strips – straps? – of early date. Naturally, given it was now past 7pm, there was an immediate and unspoken agreement to interpret them as battlefield artefacts. An archer’s arm-guard: sure thing! 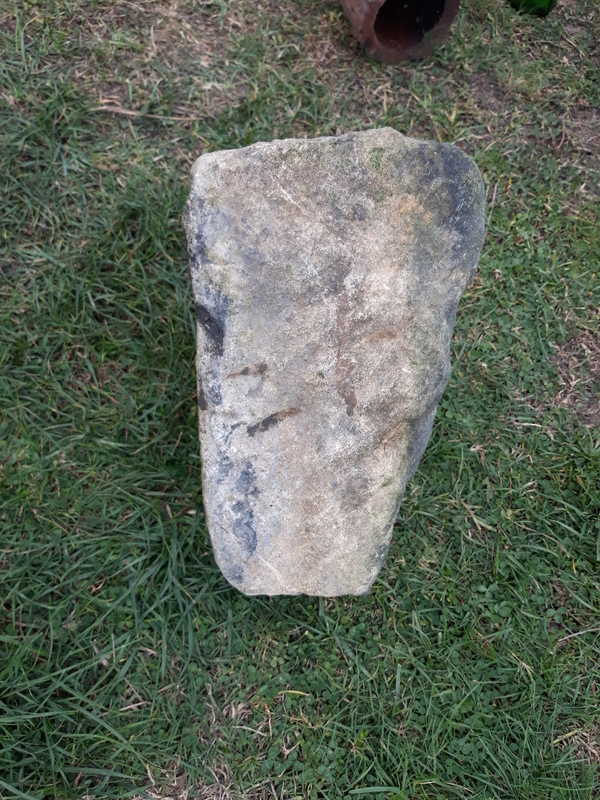 For this monastic historian, it was the less romantic but (much) more plausible provenance of a block of dressed stone we also recovered that almost made the wait worthwhile. Here there was evidence of the monastery’s development of water meadow south of their precinct, and perhaps of the fishery that fed the community, and kept them, more-or-less, within the letter of chapter 39 of their Rule, On the measure of food. River Hunters is now showing on The History Channel, Mondays, @ 9pm. This week, we’re advertising a call for papers for Exeter’s postgraduate history journal, Ex Historia. 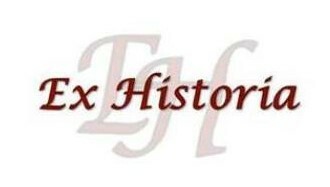 Over the years quite a few of our medieval PhD students have been involved with Ex Historia and it’s published several medieval articles and reviews, so if there are medieval postgraduates out there (at Exeter or elsewhere) who want to submit something, then please get in touch with the journal team! Please refer to MRHA Style Guide for style requirements and use British spellings in all cases except for direct quotations which use alternative spellings. Please email all submissions as Word attachments to exhistoria@exeter.ac.uk, ensuring that your name is not written anywhere on your document in order to ensure that the refereeing process is blind. If you have any questions about the process or the journal, please do not hesitate to email the address above. The deadline for submissions is Friday 14 December 2018 for original articles and review articles and Monday 28 January 2019 for book reviews, but we would certainly appreciate any early submissions. 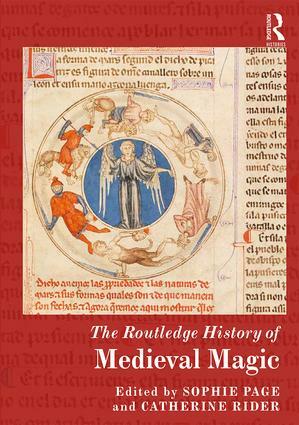 Welcome to a new academic year of Medieval Studies! Well, term has started and campus is suddenly full of students again. Here in the Centre for Medieval Studies we’re catching up with existing colleagues and students, as well as welcoming some new ones. We have several new PhD students starting in History and Archaeology and would like to welcome them to our community of postgraduates, along with new students on the MA History with medieval interests. It’s also a good time to celebrate some successes from the last year. In particular, congratulations to Tom Chadwick, who got his PhD last year. Tom has posted several times on the blog (for example, here) about his research on the Normans. This term we have an exciting seminar programme, running every other Wednesday – details here. All staff and students with medieval interests are welcome! 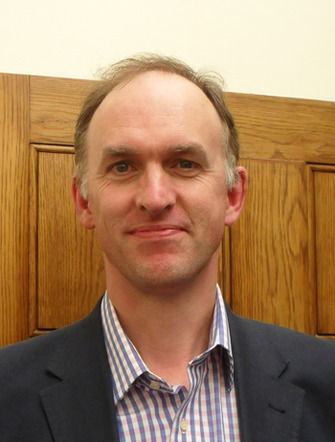 One highlight is at the end of term, when Roger Collins (University of Edinburgh) will be giving our first Simon Barton Memorial Lecture, on ‘Faith, Culture and Identity in Medieval Spain’. This was a topic close to Simon’s own research and we hope to make it an annual event. We’ll also be hearing from staff and students on the blog – next week, PhD student Ed Mills. Wishing everyone the best for the new term. Over the last two decades, scholars have shown great interest in how group and institutional identities were constructed and contested within (and beyond) the Middle Ages. Much attention has been given to the role of narrative histories of peoples, regions and religious houses in this context. Only relatively recently, however, has the contribution of more ‘documentary’ sources come to be appreciated. 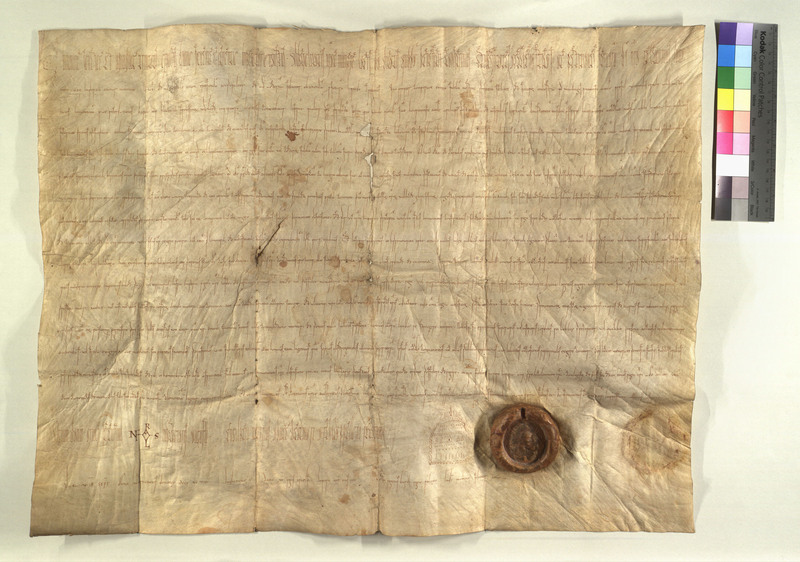 In recent years, we have learned that cartularies and cartulary-chronicles are not merely repositories of texts, but powerful statements about local and institutional identity. These sessions seek to develop these lines of investigation further by examining the contribution of forgery to these processes. They aim to bridge the gap between the study of historical memory (which until recently has taken written narratives as its starting point) and documentary forgery (which tends to focus on the legal implications of such texts), offering new vantage points on old problems regarding uses of the past in the Middle Ages.
) by 15 September, with an indication as to whether you wish to be considered for the Kalamazoo or Leeds sessions. Two sessions are already confirmed at the former, while I am looking to organise anywhere between one and three at the latter (depending upon demand). 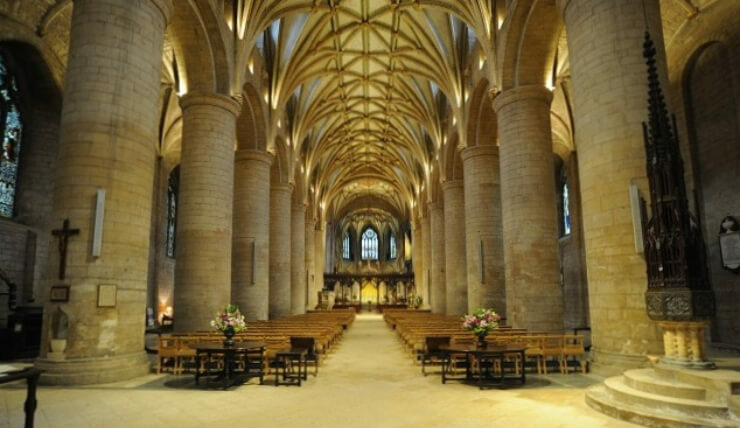 A couple of weeks ago, on Saturday 17th March, a few staff in the Centre had a stall at the University’s Community Day to showcase some of the research we do relating to Exeter Cathedral. We had interest from people of all ages, asking questions about our projects, the pictures and maps we were showing, and about life in medieval Exeter more generally. Here is a short taster of the research by Sarah Hamilton, Oliver Creighton and me that was on display. We’re also in the early stages of planning a larger scale project which looks at the history, archaeology and manuscripts of Exeter Cathedral, and if you’d be interested in hearing more please feel free to get in touch with me. Exeter Cathedral and its World: Sarah Hamilton focused on Cathedral MS 3518, a liturgical manuscript which lists, among other things, the saints commemorated by the Cathedral community each day. 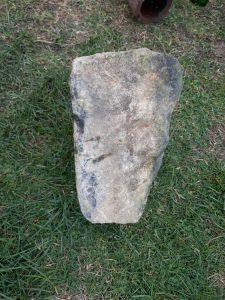 This includes the major Christian saints as one would expect but it also includes a number of more local saints from the South West of England, such as Nectan of Hartland and Petroc of Bodmin. Looking at these saints is one way to understand how the medieval clergy of Exeter Cathedral thought about their local history, and people had fun trying to spot the saints’ names in the images of the manuscript (surprisingly tricky: I never did find Rumon of Tavistock…). Medieval Medicine in Exeter Manuscripts: I was looking at Cathedral MS 3519, a collection of medical treatises and recipes from the early fifteenth century, particularly some of the ones relating to pregnancy and fertility. Recipes like these are often striking for their weirdness (at least to modern eyes) – eating animals’ reproductive organs to stimulate men’s and women’s fertility, for example – but they are also a fascinating way to think about medieval people’s health concerns. What Lies Beneath? A Geophysical Survey of Cathedral Green, Exeter: Oliver Creighton contributed some images from a geophysical survey of the Cathedral Green that he undertook last year with other staff and students from Archaeology. This was probably the most popular part of our stall, as people tried to interpret the black and white images and work out if there was a Roman road underneath the cloisters. And if anyone wants to hear more about one of Exeter Cathedral’s most famous manuscripts, the Cathedral is holding an afternoon event celebrating the Exon Domesday on 17th April: see their website here for more details and to book. As many of you will know by now, our former colleague Simon Barton died suddenly just before Christmas. 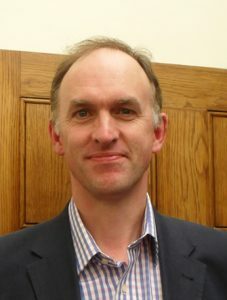 Simon had been at Exeter for many years, first in Modern Languages and then in History, before leaving in December 2016 to take up a chair at the University of Central Florida. Simon will probably need no introduction to many of you: if you didn’t know him in person, you have probably come across some of his work on medieval Spain. He was – among many other things – always a great supporter of the Centre for Medieval Studies, and was also one of the founders of our MA Medieval Studies. For more on his work at Exeter see the lovely tribute that Alun Williams wrote for the blog just over a year ago, when Simon left us for Florida. Since news of Simon’s death began to circulate, there have been many tributes posted online, especially on Twitter, from his friends, colleagues and students, in the UK and overseas. A colleague at UCF has also set up an online tribute wall here. Instead of repeating these comments this blog post seeks to record the memories we have in Exeter of Simon as a friend, colleague, teacher and PhD supervisor. When I put out a call to the Exeter medievalists for their thoughts, the response was – predictably – huge. I have tried to include as many contributions as possible but in order to keep the size of this blog post manageable I have edited some of them down. Not everyone was able to comment here, but I think these tributes speak for many of us in the Centre, even those who haven’t commented separately. Simon will be sorely missed! 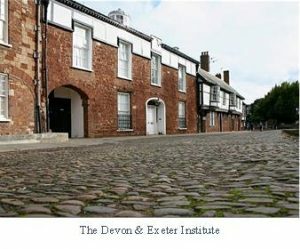 Last July Cheryl Cooper, who had just completed a History degree at Exeter, did a student internship (funded by the College of Humanities and the Widening Participation scheme) looking at resources for medieval research in the Devon and Exeter Institution. She sums up her findings here. Now that we’re gearing up for the new academic year it might particularly interest returning undergraduates and MA students who are thinking about possible dissertation topics. For Exeter students and staff, Cheryl’s full report will shortly be put on the undergraduate and MA history dissertation ELE sites. 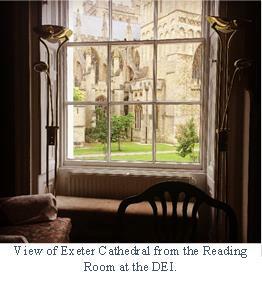 The DEI is one of Exeter’s hidden gems. A perfect paradise of calm and tranquillity for writers, historians and anyone looking to escape the hustle and bustle of the city. Tucked away in the historic centre of Exeter, the DEI, from the outside, looks like many of the quaint buildings in Exeter Cathedral quarter, boasting beautiful cathedral views but you would be remiss to believe that this is where the magnificence of the DEI ends. The real treasures of the DEI are located just behind the historic front doors. Founded in 1813 for ‘promoting the general diffusion of Science, Literature and the Arts, and for illustrating the natural and Civil History of the county of Devon and the History of the City of Exeter’, the DEI holds over thirty-thousand volumes and thousands of maps, prints and pamphlets and continues to be a ‘living library’ in which new acquisitions continue to be sourced. Students of Exeter University are automatically eligible for membership of the DEI for the duration of their degree, but unfortunately (or fortunately depending on your point of view) the DEI is a place that stays undiscovered for many students at Exeter. This may be partly due to the fact that many students, myself included, were/are unaware they are members of this hidden gem. As well as boasting a rather grand and peaceful reading room there are a number of study desks located in the library itself. The DEI makes a welcome change to the hustle and bustle of the campus library, and whether you choose to study in the library itself or in the reading room under the shadow of the cathedral, you will not be disappointed spending a few hours in this beautiful building – in fact as historians, the environment may even add some extra flair to your historical writing, as it certainly transported me back a few decades! 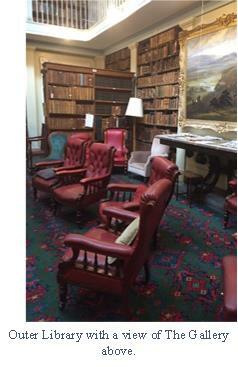 Last July I was delighted to accept an internship with Exeter University cataloguing the medieval material held at the DEI – rifling through old books in a beautiful historic building did not seem like a bad way to spend a few weeks of my summer. The aim of the role was to try and get a clearer idea of what medieval materials the DEI possessed and to organize and present my findings in a way that would be useful for medievalists. Professor Henry French and Dr Catherine Rider had informed me at interview stage that to date, there was no comprehensive list of medieval materials held at the DEI so there was no way of knowing how long this task would take. It was a case of digging through the materials and finding a way of making it accessible to future researchers. I found this an exciting prospect, if not a little daunting. It was a project which I could fully co-ordinate and organise myself and one in which no one was sure what I might find hidden in the depths of the DEI. Of course as an historian the dream of finding a rare, undiscovered manuscript, hiding, untouched on a dusty shelf was never far away. Alas, this did not happen, but I did discover that the DEI holds a wealth of resources for medievalists, in particular for those wanting to research the history of the local area and contemporary views on medieval life. The DEI (for those yet to visit) consists of two large rooms downstairs (The Inner Library and The Outer Library) and the Gallery situated upstairs. With over thirty-thousand volumes held within these rooms it was almost impossible to know where to begin. However, for this I must thank Paul and Derek from the DEI library team, who sat with me and explained how the library catalogue worked, where the most likely places to find medieval resources were and certain books of interest. Without their help I think I may have been unintentionally trapped in the DEI forever examining each book in turn! With their advice, as well as help and advice from Dr Catherine Rider, I identified the following categories as areas of interest: the Rolls Series, Local History, Wider Local History, Royal History and General History. These five areas are the ones which are covered in the most depth in my catalogue. The aim is to help medievalists who are researching the local area and students who are embarking on a research project and who want to use this local collection of sources. Working through the areas identified produced a surprisingly large amount of medieval material; so much so, that it was impossible within this internship to list every individual resource. The catalogue produced is intended to give the researcher an idea of what type of material is held in each category and list examples from each. I have also included material that I found to be the most interesting, for example The Alchemical Testament of John Gybbys, translated from a 1423 ms held at the Bodleian Library and a wardrobe account from Edward I. I have tried to select a wide range of material to showcase just how useful the DEI library can be to medievalists. 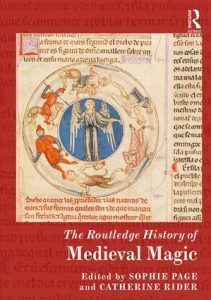 This project has highlighted the medieval resources held at the DEI and has hopefully catalogued them in way which proves useful for medievalists. I would highly recommend the DEI as a place to study for Exeter students and hopefully this guide will show that it holds potential for medieval researchers. There are still areas yet to be covered in the hunt for medieval material, so who knows that medieval manuscript or unpublished source may be hiding in the DEI waiting for you to find it! Happy researching!